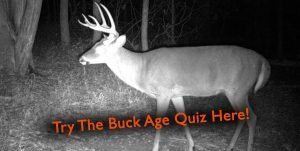 When I bought my first trail camera in 2008 I was new to deer hunting and unfamiliar with the basic strategies that most hunters employ to get good trail camera photos. Unfortunately for me that meant that I would struggle for years to find deer during all seasons, and I became pretty frustrated before learning the ropes. Hopefully by relaying what I have learned over the years I can save you some of the frustrations and improve your trail camera success throughout the year. Here is a very basic look at my personal trail camera placement strategy by season. 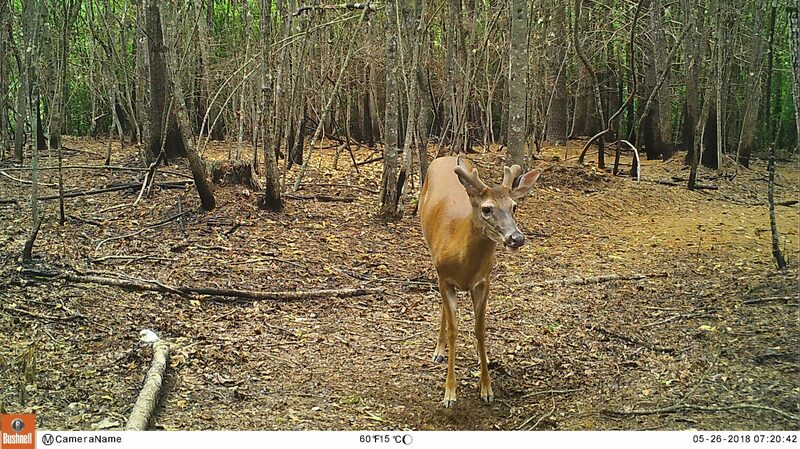 Food Sources- Placing cameras over soybean fields and other warm-season food plots can produce deer sightings. In large agricultural fields you should walk the field edge and find a corner or other protected portion of the field that allows deer to stay hidden from public roads or other disturbances. Look for evidence of deer use by surveying the beans for nipped off leaves and set your camera up looking over this area or a trail leading into it. In states where baiting is legal, you can put out corn or apples to draw deer to camera locations. I would limit this baiting to pre-season trail camera surveys though, as feeding deer over a longer period of time can be very expensive. Water- Because of heat, deer often seek out cool areas to bed during the day. Riparian zones along streams offer thermal cover that remains cooler during summer heat spells, allowing animals to escape the sun and scorching heat. Setting up a camera at a watering hole or creek crossing can be a good trail camera technique, as it often funnels deer into a very specific spot and allows you to photograph them there. However, realize that deer use of drinking water is often limited, due to the abundance of water they retain through the forage they eat. Salt/Minerals- This is my favorite way to get trail camera photos during summer, as it is very cheap and effective. During summer, deer intake large quantities of water through the green forage they eat, which leads to an increased rate of salt loss from their bodies and consequently a craving for salt. During spring, summer, and fall deer will travel great distances to seek out salt sources to satisfy this craving. For $5 you can by a 50lb salt block or trace mineral block from most farm stores (there are also many commercial deer salt/mineral blends on the market) and put it out in front of your camera to draw deer all summer long. This is much cheaper than putting out corn and it is fun to watch as the deer eat up the soil under your salt lick! As with baiting, be sure to check state regulations prior to using salt as an attraction. Additionally, it is unwise to use salt in areas that have Chronic Wasting Disease, as the prions that infect deer may be spread at salt licks. (Above) Deer love licking salt blocks/licks during the spring and summer. Food plots, agriculture fields, mineral licks, and even water sources can be good camera locations during the fall. But as summer bachelor groups break up and the rut approaches, bucks begin checking on does and moving much more. During this pre-rut time frame I like to concentrate my cameras on active scrapes. 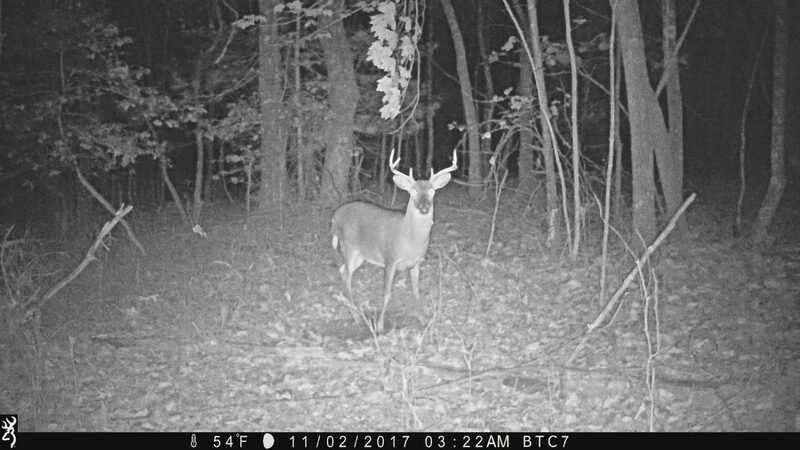 Usually I can place cameras on the same scrapes year after year, and they produce good photos of bucks standing still and working the overhead licking branch. Cameras over scrapes usually give me very clear photos of bucks standing still as opposed to cameras on trails. Once bucks begin breeding does and are occupied with their dates, the number of buck visits to scrapes will decrease. At this point I will switch most of my cameras back to food sources that does are frequenting and they will remain here through winter. (Above) A mock scrape can provide the perfect draw to get bucks in front of your camera and standing still during the fall. In winter, food is king and finding ag fields with corn and beans still in them or green food plots that are still growing can mean the difference between zero photos versus several thousand. Target food sources that are high in energy like corn and beans first, and keep the camera on whatever food source is hot at the time. If high energy grains aren’t available, deer will feed anywhere they can including food plots, young forest stands, oak flats that contain red oaks, or feeding stations (where their use is legal). Find the food source with the most deer tracks, set your camera up over it and you won’t be disappointed. As winter transitions to spring, native vegetation greens up and food plots begin growing, leading to more food on the landscape. This can either be good or bad for you, depending on whether or not you have the food. If you have a clover plot or other green food plot deer will surely be using it. As spring begins warming up, begin switching your cameras back to salt/mineral licks as deer will begin frequenting them again. Running trail cameras is very exciting, but can also be frustrating when those long-awaited trail camera card checks lead to few photos. This is just a basic overview of trail camera strategy that will hopefully lead to more success for you and plenty of good photos!